Watch This offers movie recommendations inspired by new releases or premieres, or occasionally our own inscrutable whims. With the animated film Sherlock Gnomes hitting theaters Friday, we’re looking back on other interpretations of the famous sleuth from Baker Street. When asked in interviews about inspirations for their Masterpiece Theatre take on the world’s greatest detective, Sherlock creators Steven Moffat and Mark Gatiss have cited a less-than-beloved influence: Billy Wilder’s comic, lightly revisionist The Private Life Of Sherlock Holmes. Wilder’s movie, one of the last he directed and also one of his final collaborations with longtime cowriter I.A.L. Diamond, didn’t transport Holmes into the then-modern world, the way Moffat and Gatiss’ television series eventually would. (There are no scenes, in other words, of the super sleuth consulting an early IBM computer, perhaps with the help of a different Watson.) But it did, like Sherlock after it, find plenty of humor in Sir Arthur Conan Doyle’s most famous creation, while also playing with the idea of two Sherlocks: the embellished one Watson presents to the public through his writing versus the “real,” admittedly still very brilliant version. What the film and the show really share, however, is an interest in the psychology (and, per the title, private life) of the character. 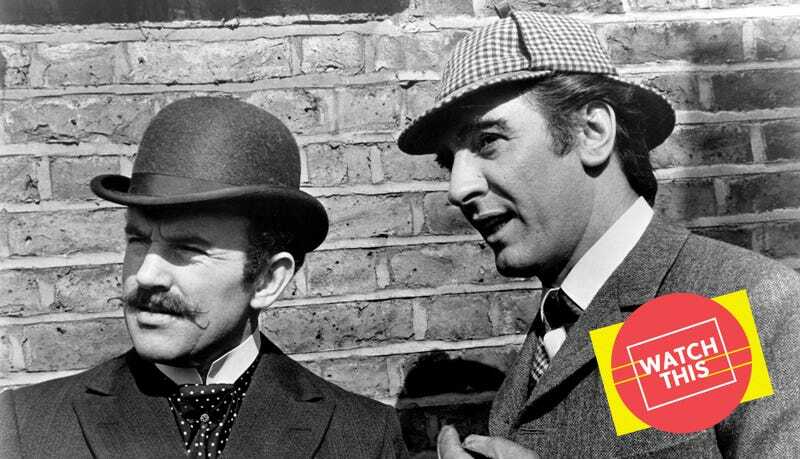 They want to know what makes Holmes tick, to give us more than the keen intellect and iconic pipe. The Private Life Of Sherlock Holmes is far from the most compelling case yanked from Watsons’ files, and its script is hardly the funniest thing Wilder and Diamond banged out together over their peerless, entwined careers. But Robert Stephens, the revered British stage actor who plays Holmes, knows how to deliver the writers’ witty, withering bon mots. When the ballerina notes that Holmes is “shorter than [she] expected him to be,” he deadpans “Oh, I didn’t mean to be”—a play on a timeless exchange in The Big Sleep. (In the same scene, one of the other Russians references Sherlock’s most famous case, “Big Dog From Baskerville.”) And in the film’s constant squaring of legend against reality, and the romantic melancholy of its final minutes, one can see a model for any Holmes adaptation interested in putting the magnifying glass to the man himself—to snooping on not just the brain racing beneath the deerstalker, but also the heart pounding under the woolen trench. Availability: The Private Life Of Sherlock Holmes is available to rent or purchase from the major digital services. It can also be obtained on Blu-ray or DVD from Amazon or possibly your local video store/library.